In 2009, I wrote a post on lazy jacks. In 2012, I posted another three posts on lazy jacks, here, here and here. Then in 2013 it occurred to me that I was being very slow on the uptake, the boat is small enough not to need them. So I removed them. No lazy jacks means that a whole series of lines are no longer there to be tangled with but it brings to the fore those vulnerable minutes between lowering the mainsail and stowing it neatly, when the wind can get hold of the sail and blow sections of it over the boat or, worse, over the side. At the same time, there may be other boats in the vicinity, so attention is divided between containing the flapping sail and avoiding the possibility of a collision. Lazy jacks are designed to avoid this so, if I have decided that the boat doesn’t need them, what is the alternative? This is the solution that works well for me. In lower wind conditions, there is no problem, of course. 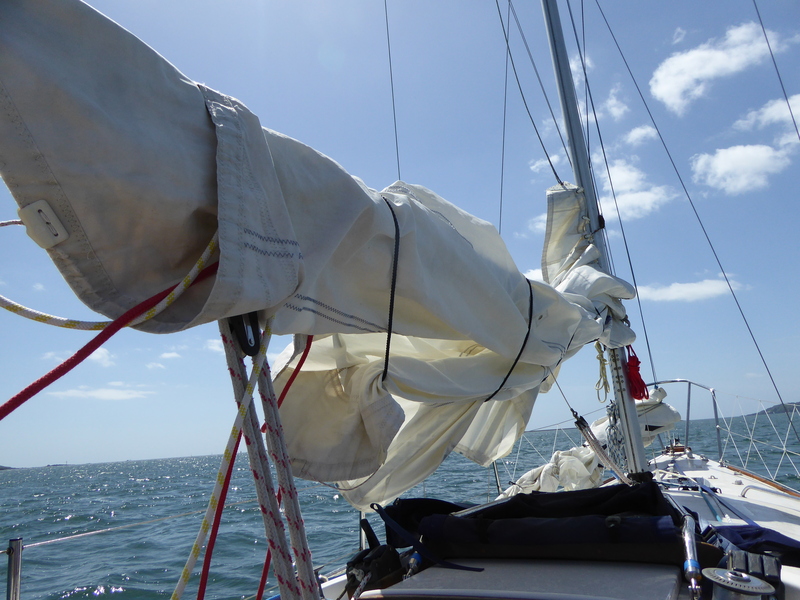 The boat is taken head to wind, the halyard clutch released, the sail dropped, the mainsheet tightened and I can stand on the deck with time to furl the sail onto the boom. The problem arises when there is a stronger wind, as there was on Saturday. There is a big difference in the effect of the wind when you are reaching before it and when you turn up into it. Suddenly, everything is flapping. Several things have to be done in a hurry. The mainsheet is released and the sail depowered. The foresail is dropped – very efficiently thanks to the new downhaul, and lashed to the port lifelines. The boat is now side on to the wind with the main flapping over the port side. 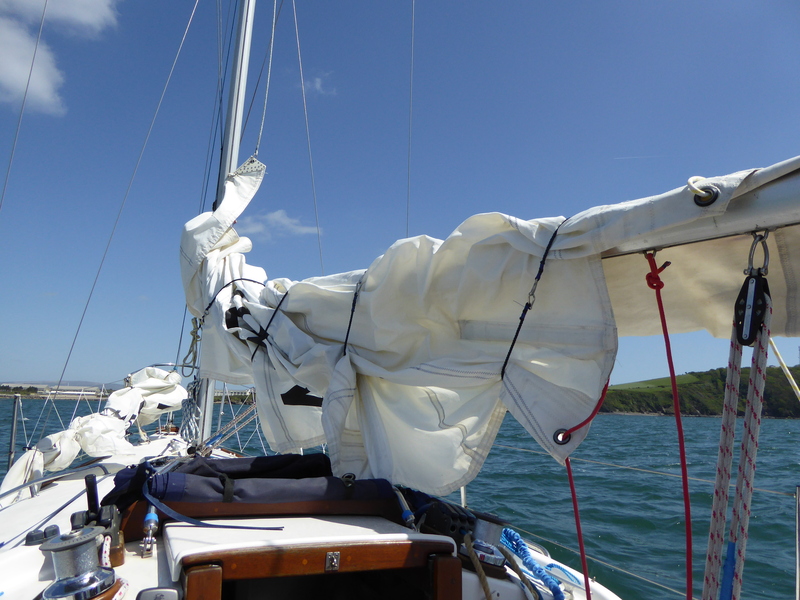 The sheet is tightened, bringing the boat back into the wind, the halyard clutch is released and it’s a quick step to the mast to haul the sail down quickly before the boat turns off the wind and jams the sail slides. What a few moments before had been an elegant work of art has now become a wild volume of loose sail cloth which needs to be brought under control. Last year, to make life easier, I made up four long sail ties with small carabiners spliced to each end. 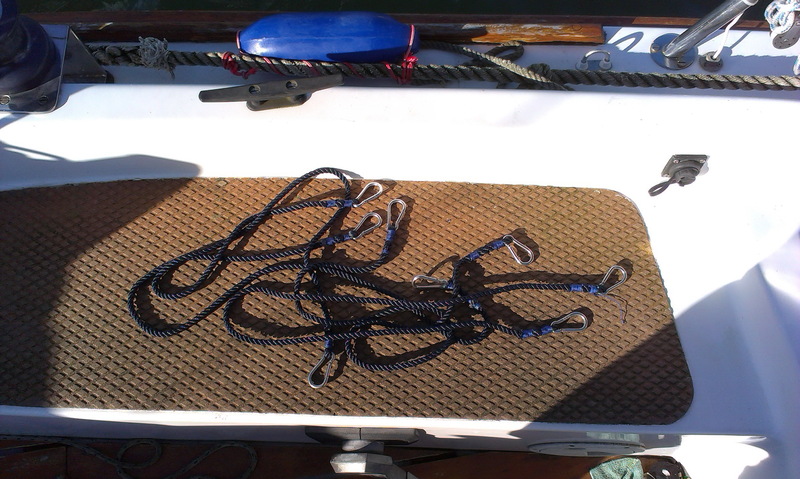 These are temporary ties that can be clipped round the sail in a few seconds. On Saturday, when the wind was gusting hard, this was how it looked with the ties in place. They took less than a minute to place. It’s untidy but the boat is quiet, the sails are under control – the foresail held down by the downhaul and lashed to the lifelines, the mainsail contained. There’s time to draw breath, look around, motor to another part of Plymouth Sound, take photographs. (Note to self: If you want to show the wind conditions, try taking a photograph of the ensign). 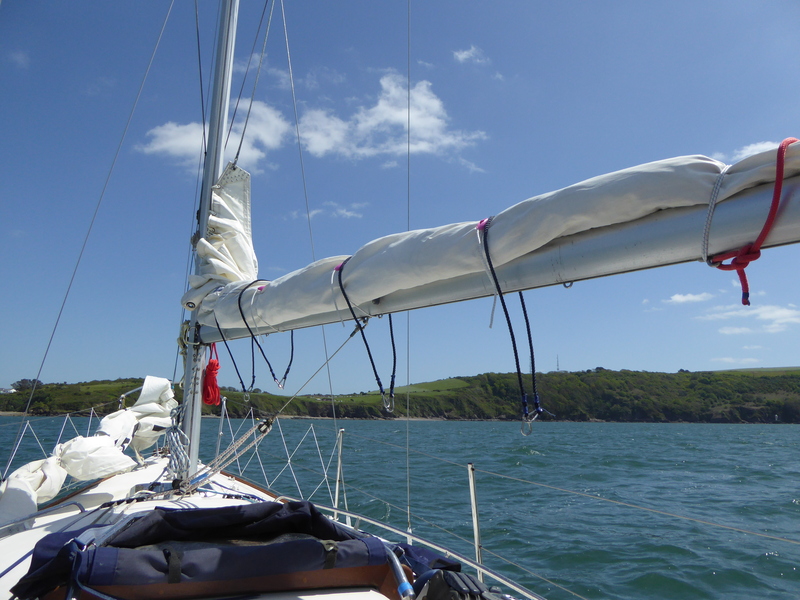 The mainsail can then be furled at leisure, without removing the temporary ties. The advantage of the carabiners is that both ends of the line are identical. It doesn’t matter which end comes to hand. These small carabiners were among a job-lot I bought several years ago and I was pleased to find a use for them. I hope they are the stainless steel they claim to be. I could have used a cheaper method – an eye splice at one end and a nylon ‘ball’ at the other, or forget the ‘ball’ and use a stopper knot instead – (I’d have to learn how to tie one of those first). A junk rig makes reefing a doddle, and it can be done in a jiffy from the cockpit.